University & College faculty, staff & students, K-12 teachers from USA are eligible to travel to Cuba under the General License, a process that can be completed by individuals & educational institutions without submitting the application to OFAC. Authentic Cuba Travel offers universities, colleges and schools from US, Canada and all over the world the best study trips to Cuba. Educational Travel to Cuba should be more than sunbathing in beautiful Caribbean beaches while sipping cold tropical drinks. Be in the know and sign up for email updates from Authentic Cuba Travel. Free Cuba Explorer Tours for teachers. Last minute discounts on Cuba Study Tours & Educational Cuba tours to keep you updated on Authentic Cuba Travel. Sign up to win a free spot on our Cuba Education Tours! Can Americans Travel Legally to Cuba? Authentic Cuba Travel offers universities, colleges and schools from US, Canada and all over the world the best study trips to Cuba. Period! School Travel to Cuba should be more than sunbathing in beautiful Caribbean beaches while sipping cold tropical drinks. CUBA STUDY TRIPS should be about an authentic immersion in Cuba’s culture and way of life, a discovery journey into what makes the largest Caribbean island such a unique destination in the Greater Antilles. At least that’s the way we see it at Authentic Cuba Travel, a leading provider of Cuba travel services in North America. At Authentic Cuba Travel, we believe that Cuba study tours should transcend ordinary tourism by engaging students with the cultural and social values of Cuban culture through peer to peer interaction. Travelling with us, students are immersed in local culture, urban buzz, history, politics, national treasures, music and contemporary arts in a context of mutual appreciation and safety. Do not wait any longer. Now is the time to start planning the next Cuba tour for your students. Your students will consider traveling to Cuba an experience of a lifetime. They will come home optimistic and inspired by fresh perspectives on what is possible not only personally but also socially. Request a custom-made no-obligation Cuba Study Trip for your students, and check some of the resources we put at your service. Request a Cuba School Tour Today! Most Popular Cuba School Programs! With customizable CUBA STUDENT TOURS, it is easy to offer North American Universities and Schools the educational experiences they expect out of Cuba travel. Not only is there a Cuba study trip to fit any group size, educational interest and budget, but each one also immerses Canadian and US Professors and students in the authentic Cuba and takes you deep into the heart and soul of the Cuban people. 100 Educator Loyalty Points per student! "The trip was well organized. The local guide and driver were really helpful and friendly. The students enjoyed experiencing Cuba and getting to know some of its unique history and culture. The rapid changes there made us all very glad to have visited at this time." "Our primary travel goal was to provide insight into Cuban environmental conservation while still being immersed in the historical, political and cultural aspects of Cuba. Recognizing this, Authentic Cuba customized an itinerary to our needs, desires, and learning goals. From a instructor's viewpoint, I was particularly impressed with how local experts played a pivotal role in the learning experiences of my students at each of sites. Our students loved the variety of activities, sites, and experiences they had, from visiting an urban 'organoponico' in the suburbs of Havana, to hiking the remote ecosystems of the Guanahacabibes National Park in the most westerly part of Cuba. Our students have described the experience as a 'once in a lifetime' experience and the 'highlight of their undergraduate education'. Authentic Cuba provided the upmost attention to all our pre-travel requests and ensured that our travels and experiences while in Cuba were high-impact learning experiences for our students. As the instructor of the this undergraduate course, I deeply thank Yane and her Toronto and Cuba based staff for giving all of us the best possible glimpse into the "authentic" Cuba that lies beyond the touristy beaches and pre-conceived notions." 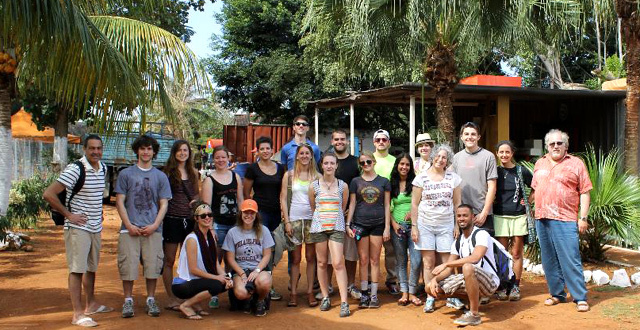 "Over the last several years I have led numerous Study Abroad trips with my students. None of them had been to Cuba. This last Spring, I crafted a course to explore the emergence of entrepreneurship in the country, as a result of some of the policy changes that have been implemented during the last couple of years. I needed to find a vendor with extensive knowledge and contacts on the ground, that could organize not only a culturally rich experience, but also a very targeted academically ambitious program. Authentic Travel Cuba was that outfit. Their staff was prompt, knowledgeadable and has strong ties on the island; they helped us plan a fantastic program that ran very smoothly. Much better than anticipated. Many of my students have called this the 'trip of a lifetime'; ; I agree with them!" "Only ninety miles from the United States, Cuba is virtually unknown to most Americans, inspiring, at best, superficial and contradictory images of an island paradise and an island prison. 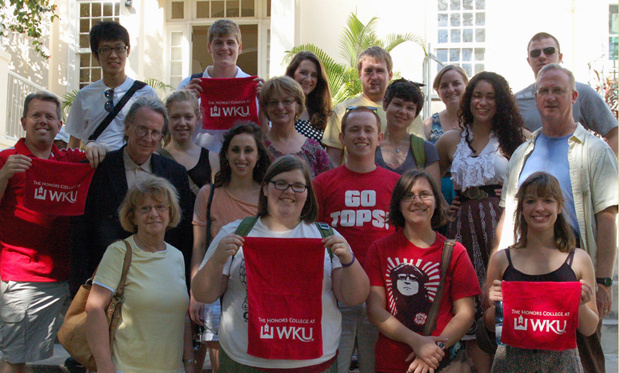 To help our students overcome such a deficit of information, Western Kentucky University sponsored its first ever Cuban study-abroad program during the 2013 winter term. As the co-leader for fourteen students and three non-credit participants, I was particularly grateful for the thoughtful and efficient arrangements that Authentic Cuba Travel provided. Not only did we have the on-site services of Ms. Mirelys Gonzales, the best tour guide that one could ever ask for, but we also had ready access to the knowledge and experience of Ms. Yane Marquez and Mr. Luis Diaz. With some travel agencies, a person feels too constricted, too confined to an established itinerary. With others, he feels too disconnected, too abandoned. Authentic Cuba Tours, I’m happy to say, navigates with professionalism between these two extremes. During the planning stage, we often had to make changes—both in our calendar and in our destinations. There was no hesitation in cheerfully accommodating our sometimes-fluid schedule. A genuine desire to ensure that we had the best experience possible in their homeland seemed to be the company’s guiding objective. I would heartily recommend Authentic Cuba to any educational group. Our study-tour with Authentic Cuba was indeed successful—successful because the group returned intellectually challenged to articulate the complexity of our nearest Caribbean neighbor. As a couple of students observed, they doubted that they had been exposed to so much information in such a short length of time since they were infants. Our readings and field trips took us across the breadth of Cuban culture—from politics to literature, from Ché Guevara to Ernest Hemingway, from agriculture to the cigar industry, from the Bay of Pigs to the Straits of Florida. Everywhere we went the Cuban people greeted us with amazing hospitality and genuine warmth. As soon as they learned that we were from Estados Unidos, they immediately wanted to strike up a conversation or invite the students to participate in a dance. As individuals, we could not have felt more welcomed. It was hard to believe that our governments have been at odds with each other. We were also keenly aware that we were at the cusp of major changes that are rapidly occurring in this island nation and returned grateful for having had the opportunity to experience Cuba when we did. Future study-abroad programs with Authentic Cuba are certainly in the interest of WKU and its students as we embrace our university's international vision. " "Everything was just great with our trip. We liked the hotel, our tour guide, our meals (especially the last lunch – what a treat!!!). It was awesome getting to play on the festival! Thanks for facilitating our official invitation to play at the Jazz Festival of Havana. We loved meeting and getting to play with Lennon Ruiz Garcia. All the Best!" "The trip was the most amazing experience ever!!! Mildred, our Cuban guide is FANTASTIC!!!! Wow!!! I can not say enough about the time we had!! The kids, the moms - everyone, had such a great time. We were treated like gold everywhere we went and everything ran very smoothly. I know I'm gushing, but I truely can not say enough about the experience! I would recommend it to anyone who would like to see Cuba the way we did! Thank you so much again for making this a trip of a lifetime for the DancEast dancers!" "The trip went absolutely wonderful. Tatiana, our tour guide, was superb and dealt with the different situations in the most professional and kind way. None of the students were in sociology, politics, economics etc. so many concepts might have been irrelevant or over their head to them or over emphasized, but this is the reason I wanted to take them to Cuba. I wanted for them to learn not only about politics, culture and society, but also what brings us together and this is the human interaction. In that perspective it was great and Tatiana was great, the many people we met were great, and the driver was outstanding." "Our tour guide (Alexis) was one of the best tour guides I have ever had. I have a PhD in Latin American literature and I had read extensively about Cuban history before joining this tour, and yet I learned so much from Alexis on this trip. He was incredibly knowledgeable about so many aspects of Cuban life: politics, history, art, music, sports, relationships … Alexis was also entertaining, comical; he had us all on the edge of our seats when he spoke. It was obvious to me that he had done his homework because he was prepared for every possible question, which he answered enthusiastically and creatively. Alexis maintained a balanced view; for example, was able to point out the benefits of the Cuban schools and health care system while explaining the problems inherent in Cuban’s economy. At the end of just 7 days, I felt like all of my questions about Cuba had been answered by an intelligent, informed professional. But his lessons on Cuba didn’t end with the tour; Alexis was constantly suggesting books and documentaries to learn more about Cuba when we returned to the U.S. What an intellectual. I am so grateful to Alexis!" "Authentic Cuba Tours created an absolutely unique, educational, and fun experience for 19 of our students. Yane and the staff were extremely responsive to our needs at all stages of planning the trip. The activities and accommodations were well-tailored to our interests and budget. The agency was quite knowledgeable about U.S. legal issues, and even helped with some of the required paperwork. I would unconditionally recommend them for a group of any size, and found them very well equipped to respond quickly to any issues both before and during the trip." "We are all back safe and sound - after our wonderful visit to Cuba. Alex and Yera, our Cuban escorts were absolutely fantastic for us. Alex is not only very well informed and experienced, but, has a sincere desire to share this knowledge and try to help us to better understand his culture. I am sure you already know this, but, I really wanted to let you know what a major impact Alex had on the quality of our stay - he is a fantastic tour guide. The other guides we had were also excellent and much appreciated. Finally, also a sincere thank you to yourself and Authentic Cuba Travel staff in Canada for all the help and assistance. The reason why I was so comfortable with you was based on the prompt and detailed nature of all your email responses to my numerous questions. " "The caliber of the artists, and the art, that our students were exposed to was nothing short of awe inspiring! Suffice to say, some presentations had students rivetted for 2 hours straight, which is near of unheard of for a teenage audience. Highly reccomended!" "This educational/cultural tour of Cuba (Havana, Cienfuegos, Trinidad, Santa Clara and environs in between and around) was certainly the travel experience of my life thus far. The pre-trip logistics and those throughout the tour were, overall, outstanding. The itinerary was engaging and provided a wide-range of learning and entertainment opportunities. The free time allotted provided us to discover on our own or with others further the wonders that are Cuba and Cubans. Our itinerary covered a lot of ground, literally and otherwise, and the presentations by the Cuban people we encountered were delivered with expertise, pride and passion. The planned dining experiences were certainly times to remember -- replete with gracious hosts, charming musicians, scenic vistas, good food and unforgettable bonding opportunities with the Cuban people." "The trip was great and exceeded expectations. The sights and sites visited were ideal and exactly what was requested. Accommodations were good. The food was awesome. The guide was super terrific with the planned agenda and many impromptu Q&A sessions. He is also a genuinely nice person. The people Cuba were so nice, in general. Cuba is a great country to travel through. Even though this was a study course—a working vacation, really—it felt more like a vacation. There is a good vibe to Cuba that is welcoming, always interesting, and fun. Thank you for your help in turning a great opportunity into an amazing experience. " "Cuba offers amazing people, a lively culture, breathtaking architecture, and a beautiful environment for the visual arts and photography. Our tour and fantastic Cuban guide Raul gave the students the time of their lives, and created memories they will cherish forever." "THE HIGHLIGHT for our students was meeting with Cuban students. We spent time with first-year student teachers of English in the teacher training college in Santa Clara. This visit was a huge hit for the Cubans and the Canadians. Within minutes the conversations were buzzing. My students enjoyed meeting with young Cubans who spoke English and the Cubans always love to practise their English. How much did they have in common? A lot as it turned out, particularly in music and political opinions. My students did not want to leave." "We are all back at school and work this week, but still dreaming of our amazing time in Cuba. The girls are all saying how much they loved the trip and what an amazing experience it was. They are planning to do a group presentation to the school at an upcoming assembly, to share their experiences with the rest of the school. Thank you so much for all your efforts and support prior to, and during our trip." "Our trip to Cuba was unbelievable and I have only one word to describe it ILEANA. Her knowledge of the country and her openness made the education components of the trip so wonderful for our students. She also could be tough when needed to protect our students and gentle when they need encouragement. The students all loved her and our bus drive. I hope your company sees the value in her services and shares it with others coming to experience this wonderful place. Thank you for a great experience you gave our students. Ileana and our bus driver were great!!!!!!!!!!!!!!!!!!!!!!!!!!!!!!!!!!!!!!!!!!! Hotels and staffs were great!!!!!!!!!! "We're baaaack. And what a wonderful trip we had!! It was a terrific itinerary - lots of wonderful visits!! And MILDRED!! What an angel she is......a wonderful tour guide and wonderful human being. We love her too now...... more Cuban friends! We will get ourselves organized with all the photos etc, and share them with you.......perhaps post some on the website?? Thanks very much....and we look forward to sharing our stories (all good!!)" "The students have all expressed how great the trip was and what an impact it has had on them. Thank you for organizing the trip, it was everything that it was promised and more!" "We had a fabulous trip thanks to Mildred- she is fabulous and we all learned so much about the culture and history while having fun. We had an amazing time. I will write a reference letter as well as an account of our trip. I have asked parents for permission to send a few pictures to you. We are going to have a group gathering/meal to share pictures and stories in a few weeks. I will be in touch. Thanks again for all your preplanning. It paid off." FREE Cuba Explorer Tours for professors, teachers and educators who want to travel to Cuba before taking their students– great for those who have not been to Cuba before. Visit to Trinidad's Academy of Painting. Tour of the school and exchange with students and teachers in the workshops. Learn about the school educational curriculum. Meet teachers and students at primary schools to learn about the primary education level in Cuba. Tour the schools and enjoy educational-cultural activities by students. Guided tour of the Latin America School of Medicine, a jewel of the Cuban education system, and one of the largest medical schools in the world. Visit to the Literacy Museum in Havana. A must-see in any Cuba education tour for teachers, educators and those interested in learning more about Cuba education system. Visit to the University of Havana, founded in 1728, a pillar of education success in Cuba. Exchange with Cuban educators and students. Followed by a tour of the University of Havana. Tour Cuba's Superior Institute of Art (ISA), the highest level of artistic education in Cuba. Meet with Cuban teachers and students of visual arts, theatre, dance and music. Meet with teachers and students of Workshop School in Old Havana. The school teaches traditional and modern techniques of restoration work. A nice visit to any Cuba education tour. Guided tour of Cuba's Ballet School, the largest ballet school in the world with over 4000 students, and the most prestigious ballet school within Cuba Educational System. During your Cuba educational tour, you will visit secondary schools. Secondary education in Cuba is compulsory from grades 7 through 9. Tel: 647-351-8191 - Anywhere else in the world!